As mentioned previously, the new BlackBerry Q10 will be released into Malaysia very soon but if you are wondering which variant of the device will be made available in our market, we believe we now have the answer for you. Thanks to the trusty SIRIM’s database, it seems that our market will receive the SQN100-3 variant which should be a good news for users that are planning to utilize LTE connective with the device since it supports both 1800MHz and 2600MHz spectrum band. 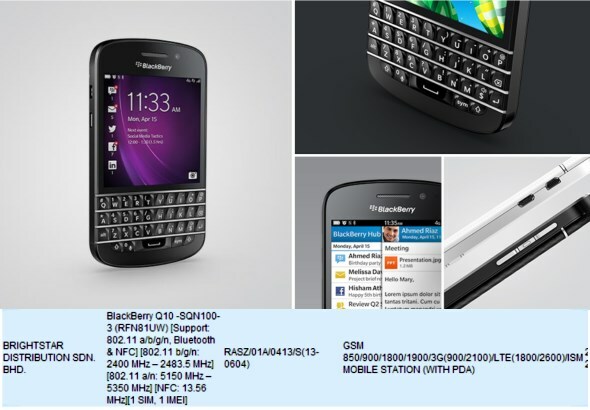 According to the database, the BlackBerry Q10 SQN100-3 is registered under one of the company’s long-time authorized distributor, Brightstar. A follow-up to BlackBerry Z10, the BlackBerry Q10 is the first BlackBerry 10 device to feature a QWERTY keyboard. More Malaysia-specific information about the device should be revealed by BlackBerry on 30 April, so make sure to tune in on that day to learn more about the new BlackBerry Q10.